Aubrey Christina Plaza was born on June 26, 1984, in Wilmington, Delaware. The actress became famous due to the series Parks and Recreation. The future star was born into the family of a lawyer and financial consultant. The parents chose the daughter’s name when they heard the song “Bread” where the name “Aubrey” was mentioned. The girl had two younger sisters, Renee and Natalie; today, they inspire the actress for some roles in comedies. Plaza was educated at a Catholic school. Besides, young Aubrey tried herself in acting and participated at Wilmington Drama League. In 2002, the young woman graduated from the Ursuline Academy and entered the New York University's Tisch School of the Arts. In 2004, when she was studying in New York, Aubrey Plaza had a blood stroke which led to a temporary paralysis and speech difficulties. Recovery took much time; acting became a strong motivation for her. Nowadays, Aubrey is healthy. Plaza began her career when she was a student. For some time, she worked on probation as a producer’s and director’s assistant. In 2004, she participated in a theater comedy performance; an avant-garde play followed soon. The young woman tried herself in various types of work including improvisation. Aubrey got a role in The Jeannie Tate Show and Mayne Street broadcast by ESPN. She also took part in Terrible Decisions with Ben Schwartz. In 2009, the movie Funny People with Plaza was presented; she played the role of Daisy Danby, the main character’s girlfriend. At the same time, the new comedy Scott Pilgrim vs. the World was being made; the actress joined the movie cast. After the series Parks and Recreation, the artist’s career began to develop. Critics believed it was a significant breakthrough that was going to help Aubrey Plaza become a Hollywood star. The young woman supported charity events. For instance, she joined the performance A Night of 140 Tweets: A Celebrity Tweetathon for Haiti. The actress did limit herself with series and movies: she also appeared in some music videos. The video “Hollywood Forever Cemetery Sings” was one of her brightest works. In 2014, the actress played the saxophone in another music video. Although Aubrey recommended herself as a talented actress, she gained a lead role only in 2012. She was offered the role of Darius Britt who got hired as an intern. As the story runs, the young woman gets tired of work and wants to travel, but she needs a companion for that. Many critics were not excited by the role but emphasized Aubrey Plaza’s performance and said her acting was convincing. In 2013, the young woman behaved disgracefully at the MTV Movie Awards ceremony: Plaza came to the stage when the winner Will Ferrell was there and tried to take his prize. The musician turned the situation into a joke, but Aubrey is unlikely to appear at this event again. In 2016, Aubrey Plaza played in the movie Mike and Dave Need Wedding Dates starring Zac Efron and Anna Kendrick. The actress got the role of Tatiana; critics appreciated her work. 2016 was marked with a new work: the series Criminal Minds. The actress got the role of Cat Adams who appeared in several episodes. The character was always playing with drugs and alcohol. Lenny died in the first series but came back in a different form of existence. In March 2017, a new season of the series was announced; the premiere took place in 2018. In January 2017, the movie Ingrid Goes West was released. Audrey’s character in an unstable woman; she follows every step of Taylor Sloane (Elizabeth Olsen), a famous social network user. At the Scott Pilgrim vs. the World movie set, Aubrey Plaza met the actor Michael Cera. They felt attracted to each other and enjoyed their feelings for several months. In 2010, the young people went to Las Vegas and, as the actress confessed, almost married in one of the city churches. For some unknown reason, the couple split up. Soon, Plaza started dating the writer and director Jeff Baena. The lovers began to live together and collaborate on various projects. 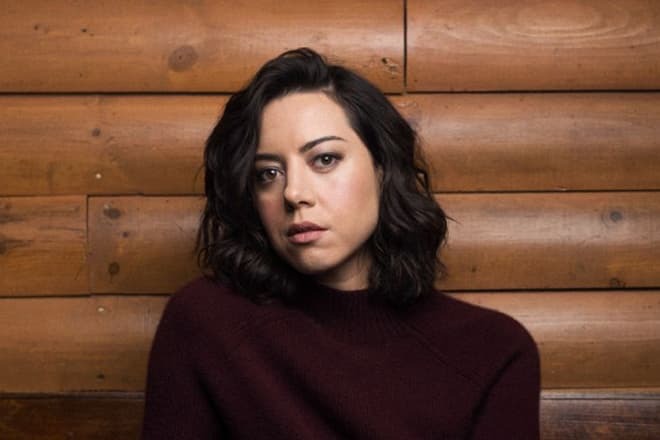 Today, Aubrey Plaza participates in diverse projects. In 2018, she appeared in the movie An Evening with Beverly Luff Linn and continued to star in Legion. The actress is an active social network user; she often posts funny photos and videos on her Instagram.